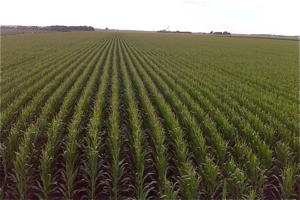 Nebraska is known as the “Cornhusker State” – and is the third largest corn-producing state in the United States. High quality, reliable supply and abundant production. Those are the words that best describe Nebraska corn! Nebraska, after all, is known as the “Cornhusker State” – and is the third largest corn-producing state in the United States. A good climate and soil combine well with the progressive farming techniques used by Nebraska farmers. Many Nebraska farmers also access irrigation water, which allows them to supplement Mother Nature when necessary (most farmers in other states don’t have this option). Add all that up and you can understand why Nebraska farmers consistently produce a high quality, extremely reliable and abundant supply of corn for feed, fuel and fiber. 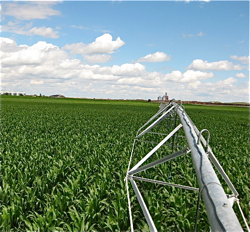 Farmers have become significantly more efficient with water use – and are using less water while producing more corn. Technology like watermark sensors and evapotranspiration gauges, along with new research, are making a significant impact. Over the years, farmers have become significantly more efficient with water use – and are using less water while producing more corn. Technology like watermark sensors, which measure water in the soil, and evapotranspiration gauges, which measure how much moisture corn plants have taken up and evaporated into the air around them. That combined data, along with new research, is making a significant impact. There are 1,861 million bushels of grain storage capacity in Nebraska. Commercial storage facilities hold 761 million bushels, and on-farm storage capacity is 1,100 million bushels. The high volume of on-farm storage is ideal for isolating specialty corn. It also allows farmers to store their crop for delivery (or sale) later in the year. Nebraska has excellent rail service from some of the nation’s largest railroads, including Union Pacific and Burlington Northern/Santa Fe. The state is covered by approximately 3,800 miles (6,114 kilometers) of rail. The Union Pacific Railroad headquarters are in Omaha, Nebraska, while North Platte, Nebraska, is the site of Union Pacific’s Bailey Yard, the largest rail complex in the United States. Nebraska’s railroad system provides access to Mexico and Canada, ports along the Atlantic and Pacific coasts, the Gulf of Mexico and the St. Lawrence Seaway, and destinations throughout the United States. The most direct mid-continent route to the West Coast passes through Nebraska, with branches terminating in Portland, Spokane and Seattle and a southern branch terminating in Los Angeles. Unit trains moving south out of Nebraska can reach Laredo or other Mexican border crossings within three days. The Missouri River, Nebraska’s eastern border, provides a water link to the Gulf of Mexico via the Mississippi River. Eight Nebraska ports encompassing 19 terminals on the Missouri River (most with rail connections), are available for service by approximately a number of barge owners and towing companies. Eleven additional terminal facilities are available to shippers in Sioux City and Council Bluffs, Iowa. The U.S. Army Corps of Engineers maintains a channel for 735 navigable miles from Sioux City to the mouth of the Missouri River near St. Louis. The river is navigable approximately eight months of the year (April through November). It is free flowing with no locks or dams. All of Nebraska’s communities are connected by a good system of all-weather roads. The system contains approximately 96,000 miles (154,000 kilometers) of hard-surfaced roads, which helps maintain the quality of Nebraska’s corn crop as it is harvested and transported to storage efficiently. Interstate 80, which is the only coast-to-coast (New York to San Francisco) segment of the U.S. interstate highway system, is included in the system. North-south interstate highways, which add to Nebraska’s market access, are I-29 passing along Nebraska’s eastern border and I-25 in close proximity to the state’s western border. There are currently 575 motor freight carriers with authority to operate within Nebraska and to and from other states.